The Iditarod is the Last Great Race on Earth, or so the slogan says. The 1,000-mile trek from Anchorage to Nome, Alaska, occurs in March every year, with more than 1,000 sled dogs taking part in the race. Dog teams average around 16 dogs built for speed, stamina and resistance to the cold weather. While any dog with the appropriate thick undercoat is acceptable, Alaskan huskies are popular. The Alaskan huskies are a special mix of the hearty Alaskan malamute, the quick Siberian husky, local Inuit dogs and others. While they rule the ice, Alaskan huskies are prone to a rare hereditary phenotype that consists of polyneuropathy with ocular abnormalities and neuronal vacuolation (POANV), which can eventually lead to an early death. Using samples from affected Alaskan huskies and controls from both the Alaskan husky and unaffected purebred populations, a study published last month in the journal G3 set out to find the genetic link to POANV. Linkage and homozygosity gene mapping of 43 dogs, aided by breeder pedigree information, led the authors of the paper to a region on chromosome 19. Whole genome sequencing of three dogs helped the group to identify a short interspersed nuclear element, or SINE, insertion in the RAB3GAP1 gene within the same chromosome 19 region. SINEs are the only mobile elements in the genome that can jump autonomously, sometimes causing havoc by landing in the middle of genes. This insertion in particular showed perfect co-segregation with the disease phenotype in Alaskan huskies and was not found in any other breed, suggesting this single variant was likely responsible for the POANV phenotype. RAB3GAP1 is part of a complex that regulates Ras family G proteins, which are integral parts of the intracellular vesicle trafficking. Interestingly, RAB3GAP1 variants are already known to be responsible for a similar human phenotype called Warburg Micro syndrome-1 (WARBM1). Intriguingly, similar to POANV, WARBM1 is characterized by central nervous system abnormalities with eye malformations. But WARBM1 is rare; the disease has been reported in fewer than 100 patients worldwide. Such uncommon diseases like WARBM1 are a challenge to treat, especially when patients may not survive the first decade of life. However, given the seemingly similar causes, there lies potential in studying human WARBM1 within these POANV dogs. 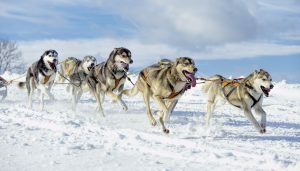 While they might not be running the Iditarod, Alaskan huskies affected with POANV may be a uniquely qualified model for the study and treatment of this rare human disease. It would not be the first time man’s best friend helped him to live a longer, healthier life. One Comment on "Sled Dogs Pull Their Weight in Rare Disease Genetics"